I've been a huge movie fan for centuries, but never tried to do a movie review. So, I'm gonna kick-off my very first movie review on "The Internship". 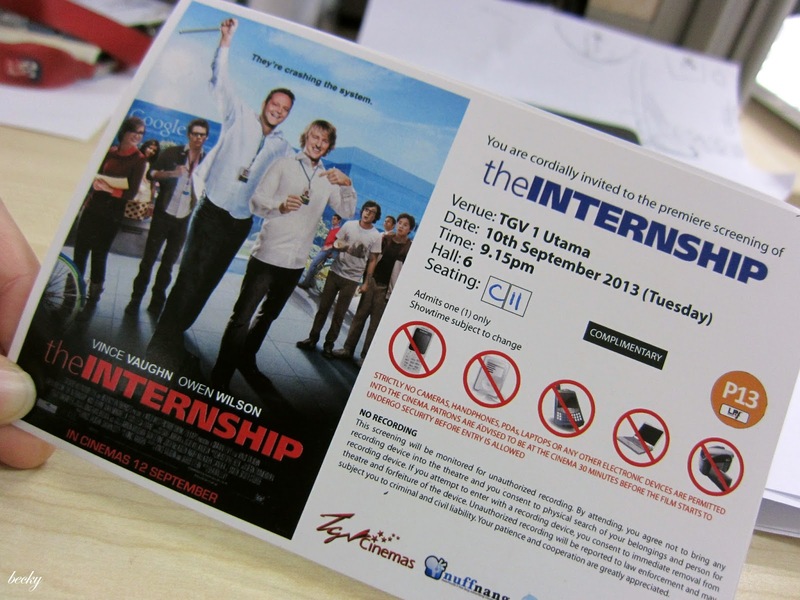 Thanks to +Nuffnang Stickman, I received a pair of premiere invitation to watch the movie at TGV 1 Utama. "2 watch middle-age salesman seek employment after being laid off when their employer went out of business. Both of them, neither being IT savvy nor other working skills, applied an internship at Google and got accepted for the internship. Both of them will have to compete with a bunch of young and smart interns who have the in-depth knowledge of IT, just to lay themselves a job in Google." Despite the negative comments I've read on-line, I'd still say this is a funny and worth-watching movie.It is a very light comedy and I can really relate to the movie. Same as the characters played by Vince Vaughn and Owen Wilson, I do have people around me who are not so IT savvy and they really tend to say some silly things sometimes - just like the movie. Apart from the comedy, I really love the messages that they want to convey through the movie - "Never give up, Live your dream, and you'll never know what surprises you'll get along the way". At the very least, this movie motivates me in this way. On a side note, Google office is REALLY REALLY REALLY REALL SUPERB!!!!!! OMG!!!!!! You could see quite a few areas of the Google office in the movie, and I must say, no wonder Google has been rated one of THE BEST company to work for! So, if you are free over the weekends, why not drop-by the cinemas and give this movie a chance.